In Chemistry we collect data in the laboratory while performing an experiment. Our second project concerns measurement and data collection in the field (CHM 1020 has no lab component). As an experiment you can do from the 1st week to the last, we can find out what your energy consumption and cost are for driving a car. Here is the project which we will start ASAP and finish the last week of the term. (5 – 10 Points). This experiment is equivalent to several small projects as it is an intense 12-14 week exercise in data collection for 30 points for an A-15 class or an intense 10-12 week exercise for a B-12 Class. A-7 or CV-7 classes collect for 5-7 weeks and data collection is worth 10-20 points depending on the # of weeks data is collected. During the last weeks, you fill your tank again and record the data*. To finish the project, you need to complete the annual projections and write a conclusion. Directions are below. *You need to only fill the tank twice, at the beginning and at the end of the project. 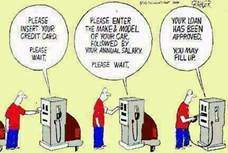 You will not use the first fill-up in your calculations, except odometer reading. Why?